ETSA Park Stadium will host Knees of Fury 32 on February 26th, 2011. 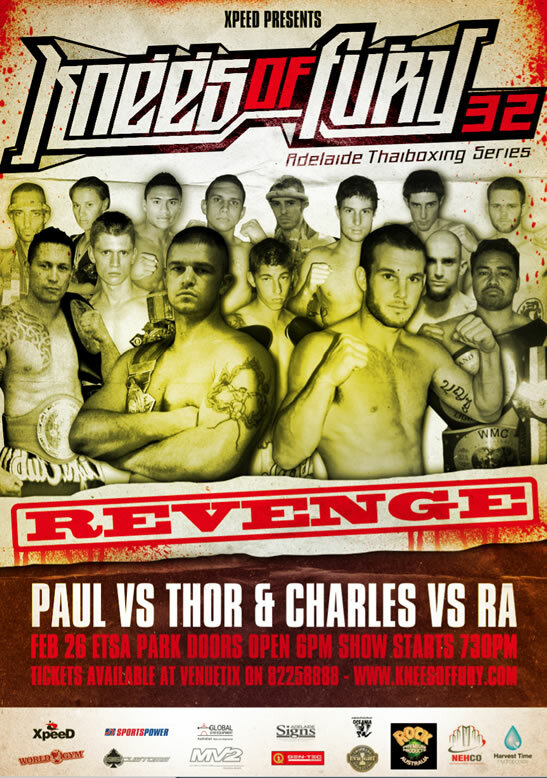 In something of a revenge match two of Australia’s heavyweight world champions Paul Slowinski and Thor Hoopman will fight again in Knees Of Fury 32. Slowinski will get his chance against Hoopman, who he dropped a points decision to last year. Both fighters hold WMC tournament championship belts and both champions have two of the highest knockout ratios in the sport. Slowinski made a memorable return to Muay Thai rules bouts by delivering a swift knockout to France’s Patrice Quarteron in the RISARC promoted Champions of Champions II. Prior to Slowinski’s return to Muay Thai Slowinski competed in K-1 and had many memorable fights against the top tier of K-1 heavy weight roster. The card now has the following bouts scheduled to occur.